Blue Mosque (Sultanahmet Mosque) : Masterpiece of Ottoman craftsmanship, Blue Mosque built in 17th century, the inside is covered with 20,000 shimmering Iznik tiles interspersed with 260 stained-glass windows; calligraphy and intricate floral patterns are painted on the ceiling. Hippodrome (Roman-Byzantine stadium) : Once a Byzantine stadium for chariot racing with seating for 100.000, the Hippodrome is decorated with Dikilitas (Egyptian Obelisk), from the 15th century BC, Yilanli Sütun (Serpentine Column) was taken from the Temple of Apollo at Delphi in Greece, where it was dedicated after the Greek victory over the invading Persians in the 5th century BC and with Örme Sütun (Column of Constantine Porphyrogenitus). 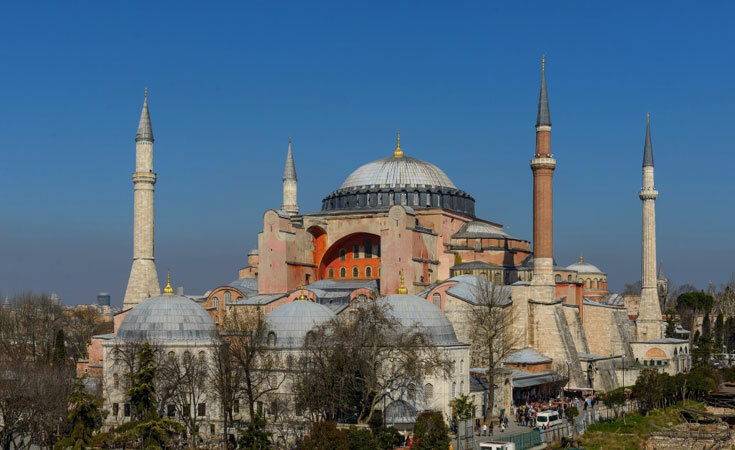 Hagia Sophia (Church of the Holy Wisdom) : Greatest work of Byzantine architecture and for almost a thousand years, starting from its completion in 537, it was the world’s largest and most important religious monument. Decoreted with the mosaics, turned into a mosque after the conquest of the city by Mehmet the Conqueror in 1453. In 1935, Atatürk turned Aya Sofya into a museum. Basilica Cistern : The most famous cistern whose present form dates to the reign of Justinian in the 6th century. A journey through this ancient underground waterway takes you along sparsely lit walkways that weave around 336 marble columns that rise 26 feet to support Byzantine arches and domes, from which water drips unceasingly. Topkapi Palace : Residence of sultans, to being the seat of Ottoman rule from the 1460s until the middle of the 19th century. The main entrance, or Imperial Gate, leads to the Court of the Janissaries, also known as the First Courtyard and has always been, freely accessible to the general public. The Second Courtyard, once the administrative hub of the Ottoman empire, is planted with rose gardens and ornamental trees, and filled with a series of ornate kösks, pavilions once used for the business of state as well as for more mundane matters, like feeding the hordes of servants. To one side are the palace’s kitchens, where more than 1,000 cooks once toiled at the rows of immense ovens to feed the palace residents, whose numbers sometimes swelled to 10,000 or 15,000 during special occasions. Straight ahead is the Divan-i Hümayun (Assembly Room of the Council of State), once presided over by the grand vizier. The Harem, a maze of 400 halls, terraces, rooms, wings, and apartments grouped around the sultan’s private quarters, evokes all the exoticism and mysterious ways of the Ottoman Empire. Beyond the Harem is the Third Courtyard, shaded by regal old trees and dotted by some of the most ornate of the palace’s pavilions. The Treasury, four rooms filled with imperial thrones and lavish gifts bestowed upon generations of sultans is placed in this courtyard. The Fourth Courtyard, more of an open terrace, was the private realm of the sultan, and the small, elegant pavilions, mosques, fountains, and reflecting pools are scattered amid the gardens that overlook the Golden Horn and Bosphorus. Grand Bazaar : Maze of 65 winding, covered streets crammed with 4,000 tiny shops, cafés, restaurants, mosques, and courtyards, Grand Bazaar is the shopping mall is the largest concentration of stores under one roof anywhere in the world.